1 Rinse, peel and trim the hard ends of white asparagus. Cut the thicker asparagus lengthwise, leave the thinner asparagus as whole, and cut all the white asparagus in about 5 cm (approximately 2 inches) pieces. 2 Place a pan with water and the lemon juice over heat, add the sugar and the salt into it and let boil. Add the asparagus and cook for about 15 minutes until al dente. Rinse, peel and cut the rhubarb diagonally into 1 cm (approximately ½ inch) thick pieces. Add the rhubarb to the asparagus during the last 5 minutes of cooking. Drain the asparagus and rhubarb, and collect the broth. 3 Mix about 100 ml (approximately ½ cup) of the collected broth with the sunflower oil, balsamic vinegar and the parsley, and whisk well. Season with salt and pepper, and mix with the cooked asparagus and rhubarb. 4 Rinse the watercress and shake dry. 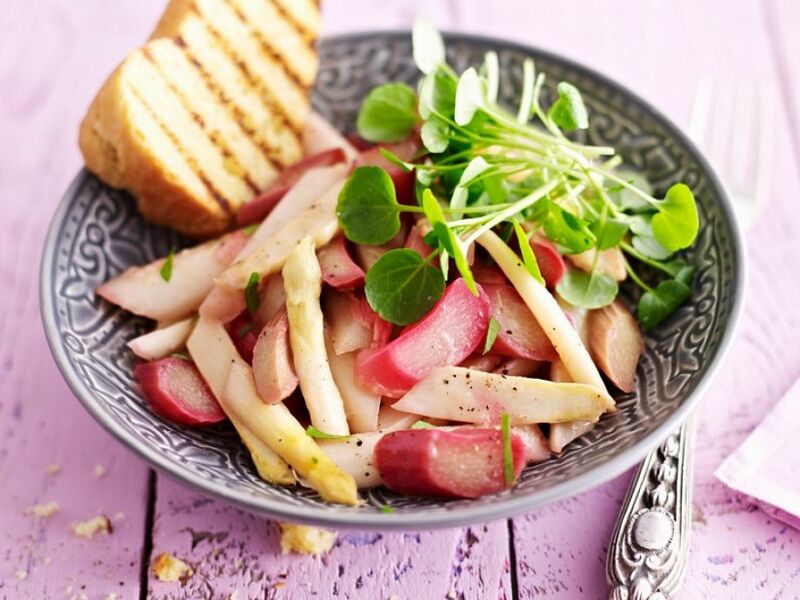 Arrange the asparagus and rhubarb salad on plates and distribute the watercress over. Serve the salad warm or cool. Serve with toasted white bread.